The patented SKINCOM Solartent EASY for TWO is the new "state of the art" concerning mobile and secure sun protection. 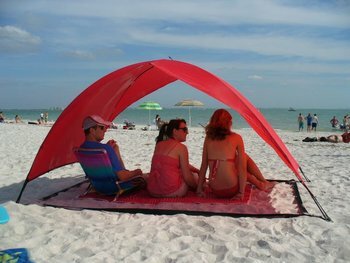 Providing a surface of 126 x 59 inch / 300 x 160cm, the EASY for TWO solar tent provides generous shade for up to 4 people, even during intense midday sun. With a protection factor 60 in accordance with UV Standard 801 / factor 50 + after AS / NZS 2604 Standard.